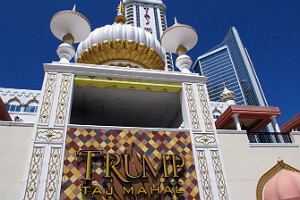 The shuttered Trump Taj Mahal in Atlantic City is further distancing itself from its past as workers were seen to be dismantling the property’s iconic minarets and other outside decorations that had adorned the Indian-themed hotel and casino complex for over two decades. Back in the early 1990s when Trump Taj Mahal opened doors, it was touted as the eighth wonder of the world by its then-owner Donald Trump. The property was popular gambling and entertainment spot during Atlantic City’s glorious days. Two decades later, the complex, just as its home town, began facing bigger and bigger issues arising from newly emerging casino competition from New Jersey’s neighboring states. In the meantime, Mr. Trump gradually cut ties with Atlantic City by selling Trump Taj Mahal and his other properties in the gambling hub in a bid to prepare himself for his future political career. In 2015, New York businessman Carl Icahn purchased the Indian-themed Boardwalk resort barely saving it from bankruptcy and in hopes to revitalize it to its former glory. The property eventually closed doors in October 2016, with Mr. Icahn blaming a month-long workers’ strike for his final decision to shutter a piece full of reminiscence of Atlantic City’s much better days. Florida casino operator Hard Rock International bought Trump Taj Mahal this past spring and promised to redevelop it into a rock’n’roll-themed resort due to open doors next summer. The dismantling of the complex’s minarets and domes comes as a natural part of its planned facelift. Hard Rock promised that by the time construction work is finished, there will be nothing left of the old Trump Taj Mahal. The major casino developer originally planned to spend around $300 million into renovating and redeveloping the shuttered property but later on upped its investment to half a billion dollars. 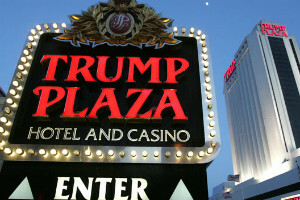 Atlantic City officials announced earlier this week that the shuttered Trump Plaza Casino, which, as its name suggests, was previously owned by President Trump, would be demolished in the coming months. The Boardwalk casino complex was one of four Atlantic City gaming properties to close doors in 2014. The property is currently owned by Mr. Icahn who was unavailable for immediate comment on what seems to be its imminent demolition. The Trump Plaza building first needs to be tested for asbestos, under New Jersey laws, and will have to obtain the necessary permission before being brought down. It is still unknown how much the demolition will cost, but many have suggested that millions of dollars could be spent, pointing to last year’s demolition of Las Vegas’ Riviera Casino, which cost over $40 million. It is believed that the Boardwalk building will be imploded in the next few months.